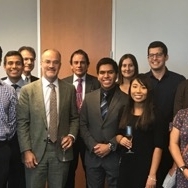 During a meeting at the Consulate General of France in Houston, students presented highlights of their experiences at University of Paris-Sud. Through a $20,000 study-abroad grant from the Cultural Services of the Embassy of France in the U.S., the first cohort of ten students University of Houston students traveled to University of Paris – Sud (UPS) during the spring 2018 semester. The grant was designed to benefit science, technology, engineering, and math (STEM) students. Each year, undergraduate and graduate students - will either take courses or work with faculty on research projects at the university. See www.uh.edu/technology/study-abroad for more information.